I learned how to make cottage cheese cheesecake recipes even though it is not as popular here in the United States as ones made with cream cheese. This is due to the fact that cream cheese was developed in New York. This is why the recipe for New York Cheesecake made with cream cheese is so popular. Even considering this I want to stress how delicious the ones made with cottage cheese are. They are favored in other countries around the world like Germany where this cheese is abundantly produced. When you learn how to make cottage cheese cheesecake recipe you will find them to be very light and mild in flavor similar to a ricotta cheesecake. It is extra delicious if made with homemade cottage cheese. This cheese is believed to have gotten its name because it was generally made at home (in cottages) typically from the milk which was left over after making butter; the cream is removed for the butter and what is left is skim milk. This cheese can also be made if desired with fresh, raw skim milk, fresh pasteurized or raw whole milk. Making cottage cheese from skim milk is why this cheese is lower in fat than cream cheese. If you learn how to make cottage cheese cheesecake recipes,this makes them lower in fat or lighter. Traditionally after the cream was removed the skim milk was poured into a crock and set in a warm place a couple of days until the milk clabbered and the whey had separated from the curd. Then the curd would be cut into cubes and slowly heated to firm up a bit. After lining a colander in the sink with cheesecloth the warm mixture is poured into the lined colander. After draining the whey, soft curds are left to be rinsed with cold water. Mix in a little salt and a little cream; this can be refrigerated for a couple days. NOTE: Unlike baked cheesecakes, many of the no bake fillings have a softer texture. Combine gelatin, ¾ cup sugar, chocolate chips and salt in top of double boiler. Beat egg yolks and milk together and add to gelatin mixture. Cook over boiling water stirring constantly until gelatin is dissolved and chocolate is melted. Chill stirring occasionally until mixture mounds slightly when dropped from spoon. While mixture is chilling prepare following crumb topping. Mix melted butter, 1 tablespoon sugar, cracker crumbs, cinnamon and nutmeg. Beat cottage cheese on high speed of mixer about 3 minutes; stir into chilled gelatin mixture. Beat egg whites until stiff; beat in remaining ¼ cup sugar. Fold egg whites into gelatin mixture; fold in whipped cream. Turn into 8 inch spring form pan; sprinkle top with crumb mixture and chill until firm. 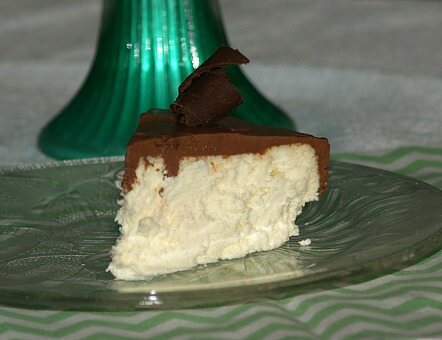 This cottage cheese cheesecake recipe is very easy to make. Pour boiling water into blender; add Jell-O and blend. Add lemon juice and 1 cup cottage cheese; continue to blend. Add remaining cup of cottage cheese and continue blending until smooth. Mix in whipped topping; pour into crust and chill. This cheesecake is delicious without the frosting. Combine cottage cheese and cream cheese and beat on medium speed until well blended. Add sugar, eggs, lemon juice, vanilla, cornstarch and flour; blend well. Fold in melted butter and sour cream; pour into lightly greased 9 inch spring form pan. Bake in preheated oven at 350F degrees for 1 hour. Turn oven off and leave in oven for additional 2 hours. 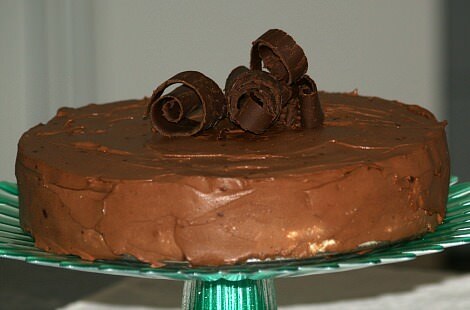 OPTIONAL CHOCOLATE FROSTING: Combine and blend together 1 Cup of SOUR CREAM and 1 cup of MELTED CHOCOLATE CHIPS. Spread on top and sides of cheesecake. Combine and mix cracker crumbs, brown sugar and melted butter. Press in bottom of 9 inch spring form pan and 1 ½ inches up sides; bake 8 minutes and cool. Mix gelatin with cold water in a small saucepan; cook until gelatin dissolves and set off to cool. Combine 1 cup sugar, 4 tablespoons butter, egg yolks, cream, cottage cheese, cooled gelatin mixture and lemon juice. Beat cheese mixture until well blended and thickened; pour into baked crust and chill overnight. This berry sauce recipe is great on a cottage cheese cheesecake recipe or any plain cheesecake and so easy to make. Puree berries, sugar and Grand Marnier in blender. If you do not like the seeds in the sauce, press through a sieve. Preheat oven to 350F degrees; grease a 9 inch spring form pan. TO MAKE CRUST combine coconut, crumbs and melted butter in bowl. Mix ingredients together; press in bottom and partly up sides of prepared pan. Bake 8 to 10 minutes; place on rack to cool completely. TO MAKE FILLING stir gelatin, sugar and salt in medium saucepan. Beat egg yolks and milk until well blended; place over low heat. Cook and stir until gelatin is dissolved and mixture is slightly thickened. Set pan off heat and cool. Drain cottage cheese to remove excess liquid; discard liquid. Beat cottage cheese in large bowl or food processor until smooth. Add the cooled gelatin mixture and beat until blended. Add the vanilla and coconut liqueur; beat until blended. Refrigerate mixture until it mounds when dropped from spoon. Beat the egg whites until stiff peaks form; fold into cheese mixture. Beat the cream until stiff; fold into cheese mixture. Pour mixture into prepared crust; refrigerate at least 4 hours. TO SERVE run tip of knife around edge to loosen; remove sides of pan. Place cheesecake on serving plate; sprinkle top with toasted coconut. Try making cottage cheese cheesecake with blueberries. TO MAKE CRUST combine in bowl the crumbs, sugar, cinnamon and nutmeg. Stir in butter; press in bottom and ¾ up sides of 9 inch spring form pan. Chill crust while preparing the filling. TO MAKE FILLING press cottage cheese through sieve. Drain cottage cheese and RESERVE the cream; set aside. Measure reserved cream in a measuring cup; fill to 1 cup with heavy cream. In a large bowl beat eggs until very thick; add sugar beating until light and fluffy. Blend in the sieved cottage cheese, cream, flour, orange juice, vanilla and salt. Blend mixture well; spoon mixture into prepared crust lined pan. Bake cheesecake 70 to 80 minutes (Knife inserted in center will come out clean). WHILE BAKING MAKE TOPPING blend sour cream and powdered sugar in small bowl. Stir in the blueberries; OPEN oven door and gently spread topping over cheesecake. Let cheesecake set in oven until cooled to room temperature; refrigerate several hours.